One of the biggest hitches in my natural form dress plan this past summer was having to make a whole new set of skirt supports before I could start the dress. 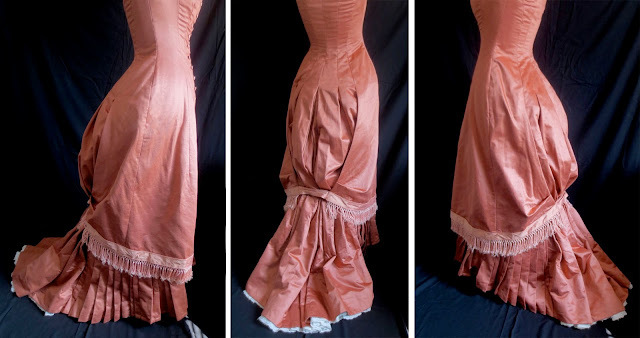 When I first planned out this project, I naively thought that I could get away with just my regular Victorian petticoat under the gown, but I quickly discovered that even though this period claims to be "natural", it takes a good bit of engineering to support the swooping trained skirt shape of the late 1870's. 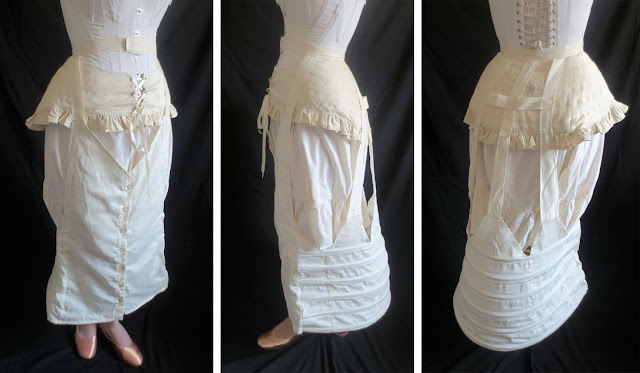 I ended up making 4 different skirt foundation pieces to wear under my ball gown, and all of these pieces include recycled materials in them in one way or another, so I'm using this set of skirt supports for my Re-make, Re-use and Re-fashion entry for the Historical Sew Fortnightly. I'm bending the rules a bit because the bulk of these garments were made well before the challenge started, but I did put some finishing touches on them this month by adding a few final hooks and ties. The first garment that I made is a hip pad, which was constructed from embroidered taffeta and cotton batting that came from a fancy coverlet that was given to me years ago. My version is modeled after the 1901 patent drawing shown on the left, but a wide variety of hip pads also existed in the 1870s as well, so I felt confident that the idea was sound even though I used a later style for reference. Although the shape is subtle, it adds a bit of "umph" to the hourglass look, which is so important with princess-line natural form dresses. Next I made a set of natural form hoops by using one of the patterns in Fashions of the Gilded Age. The hoops help hold the train of the skirt out below the knees and give it a much nicer line. The fabric is cotton sateen, and the hoop wire was recycled from a beat up vintage hoop skirt that a friend gave me. I modified the original pattern slightly by leaving off the front slits, and I also made a laced panel behind the legs like you see on lobster-tail bustles, which allows me to adjust the size of the hoops. I have never worn a bustle so low on my legs before, and I was worried that it would make it difficult to walk and dance, but I just left a few buttons at the bottom undone for the gala, and I barely even noticed that I was wearing it. Over the hoops and hip pad, I wore my usual Victorian petticoat, but then I added a tie-on ruffled back piece to fill out the train. 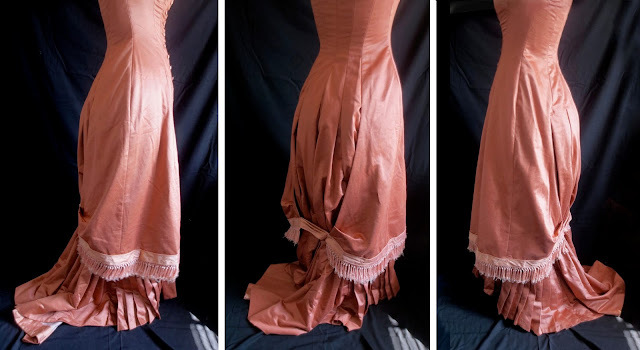 The pattern for this garment also came from Fashions of the Gilded Age, and the organdy ruffles all came from a ripped and stained vintage petticoat. This piece is actually a good bit longer than it appears in these pictures. It has a flat section at the top that is folded under when worn with this particular dress, which shortens the train length to work with demi-train styles. If I ever get a chance to make a gown with a longer train, all I have to do it flip up the top and it will work for longer lengths too. Finally, I made a balayeuse for the train, which is just a ruffle of fabric that helps support the skirt hem, provides a bit of decoration if the hem flips over, and it keeps the inside of the train clean. 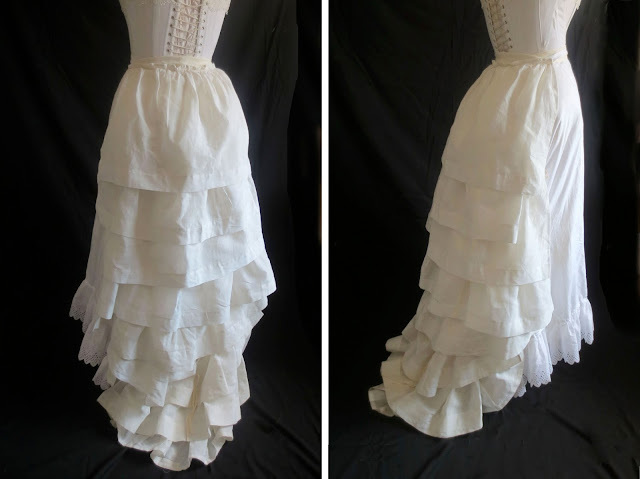 All I did for this one is cut the ruffle off of a badly damaged Edwardian petticoat and baste it to the inside of the skirt train. You can see my balayeuse at the top of this post. To show you what a difference these foundation pieces make in the overall look of a dress, I took two sets of pictures of my natural form ball gown - the first pictures show the dress worn over these four new foundation pieces, and the second set of pictures shows it with my corset and petticoat alone. It all flows so much nicer with a proper foundation, so I'm very glad I took the time to build the right support garments for my dress. 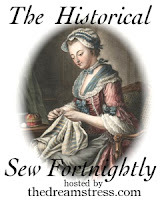 I wondered how that hoop skirt went together. Thank you for sharing! I had such undergarment envy at Costume College. I love your high tech engineered skirt supports. And they really do make a huge difference. Admittedly I do not have a single clue of fashion from this era, but it looks AMAZING!!! The attention to every detail (although not seen itself, but seen in it's function very much) is impeccable and pretty as can be! 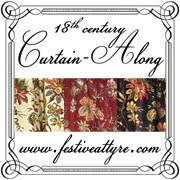 Thank you for sharing and emphazising how important the 'things unseen' (in every fashion era) really are! Fabulous post, this is so very, very useful and helpful. And like other commenters have stated - really makes such a big difference. I'm definitely going to bookmark this page for future reference. And go look up the book you used! Thanks so much for this! And are pictures of the full dress somewhere on the blog already? It looks pretty delicious, such gorgeous colour/fabric and looks to have a perfect fit! Fascinating post. Thank you so much for all the photographs; they really make it clear how all the different pieces contribute to the final look, and the final 'with' and 'without' comparison is great. This is great information to know! I've been thinking of doing a natural form dress for a while but was wondering about the methods to support the dress. Thank you for the details and photos! Aha! That hip pad is ingenious. Why did I not think of this? It must be added to my to do list. Your gown looks beautiful by the way. I love the color! Thank you for the run through. I too am thinking of making a natural form gown. Did having a hoop so narrow and close to your ankles make toilet functions difficult? Wow, you are right about the shape difference! Someday I'm going to do this era, and I definitely want to try that hoop. And, I think balayeuses are sexxy. A very instructive post and the look is amazing ! Wow, so lovely! I have been looking for part 2 of the DIY spats, regarding assembly. Was that published? I'd appreciate knowing when, as I can't seem to find it by looking at the tags in the the sidebar. Thanks ever! Oh my! Your foundation garments are fabulous!!! Isn't it great how wearing the correct underthings can make all the difference? I especially like the hip pads and the hoops! Very very wonderful! CeltChick - I never made pt. 2 of the spats tutorial because I never got a chance to make my own spats. But hopefully I'll come back to them someday. Ok, "Spats...Interrupted" ! Thanks for replying. I've mentioned the technique of making the pattern to my roomie, and she's about ready to go for it, even without part 2! I'll get back to you once we've done some work on it. Oh my goodness! I am so happy I found this post. I was considering the same thing..."Do I REALLY need all those supports?" And now I know. You saved me a lot of heartache. Thank you! !